The BBQ isn't new, but the fact it is now locked up is. So if you rent the Clubhouse and want to use the BBQ, be sure to ask for the key. 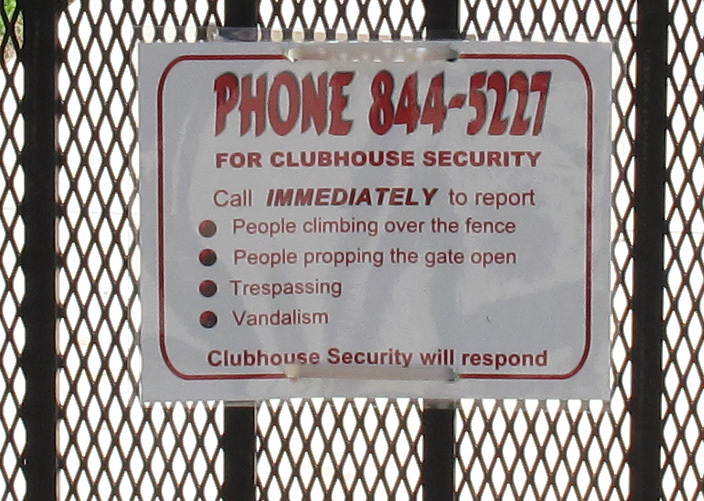 If you've been over to the Clubhouse anytime recently you have probably seen the new signs that say to phone Clubhouse Security if you see instances of trespassing or vandalism. This is an alternative to phoning the Oxnard Police Department, since non-residents wanting to use the swimming pool is low on the police priority list. Just when you were starting to think all the news was negative, here's some positive news. The beautiful needlework that graces the clubhouse meeting room was created and installed by none other than Lee Hickman, current president of the RRF HOA board.